Lawrence Sumulong (b. 1987, United States) is a Filipino-American photographer and photo editor presently based in New York City. Interestingly, photography came to him without the introduction of a formal education: Sumulong instead studied contemporary American poetry in Grinnell College, under the tutelage of scholar and writer Ralph Savarese. He traveled to the Philippines on his own in 2007 in order to take pictures with it. This homecoming eventually became an exploration of his family’s roots, as an experiential piecing together of the land and country from where his immigrant parents had come from. The following year, he begins working under the mentorship of Magnum photographer, David Alan Harvey. In this way, Sumulong’s beginnings have foreshadowed the work he will come to produce. Often returning to poetry as accompanying notes to his projects, he thinks of his photography as “personal documentary stories.” And because the stories that he seeks to tell are situated in his supposed home locality that is brimming with a language that he does not speak, the reality that gets processed by Sumulong is split by the simultaneous positioning of Filipino and foreigner. 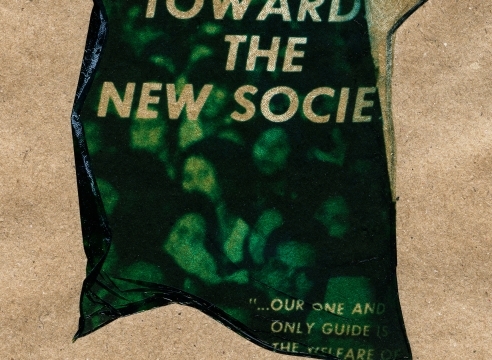 It is in this sense that he writes of being “caught between a moment of recognition/empathy and abjection/alienation,” and interested in creating work that is “layered, polyphonic and many-voiced.” Coming from this peculiar standpoint, Sumulong tackles subjects such as the Manila terrain—which he considers as his “surrogate home,” having “existed in retrograde to [his] life in America—its people, and the Filipino diaspora. 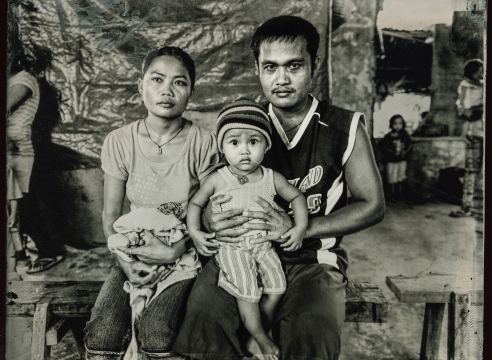 Armed with a keen sense of place and the political, Sumulong takes pictures with a decisive, yet observant eye. One cannot gaze at his photos and the stories they carry with ease. It comes plainly that social reality is almost always depicted and experienced with discomfort, and that in order for significant art to arise, veracity need not be shed. This forthcoming nature does not come as a surprise: in 1980, his parents had become immigrants in New Jersey in a move to flee the Marcos regime, which had been blacklisting dissidents. Collaborating at times with advisers and other artists, Sumulong develops relationships with and within the medium. This deep involvement with various photographic processes and techniques is all part of Sumulong’s pursuit of what best represents the stories being told in his projects. His methods range from working with a fisheye lens in order to bring out the claustrophobia of “routinely traveling through heat, smog, and the crush on the street for hours,” shooting images digitally, printing them with expired Polaroid 600 and SX-70 film, and lifting the emulsions onto recycled, unbleached paper stock, resulting in a visually distorted representation of the Philippine political system, to even more elaborate processes, such as creating ambrotypes—photographs on glass—using a 19th-century wet-plate collodion process, and printing photographs as edible frosting layers intended for cakes and later transferring them onto watercolor paper by hand. Agarici, Teodora. “Photographer Spotlights Trauma of Philippines ‘Drug War.” Global Journalist. 6 April 2018. Bubola, Emma. 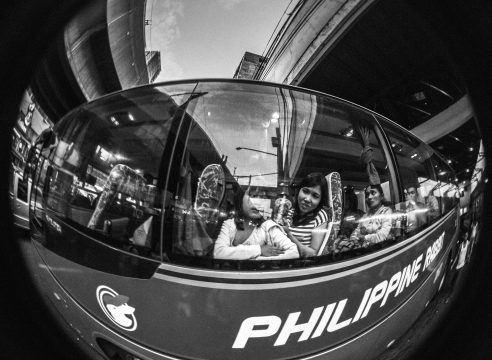 “The netherworld of the Philippines’ war on drugs.” Fisheye Magazine. 2017. Fiell, Clem. “Sugar Coated? 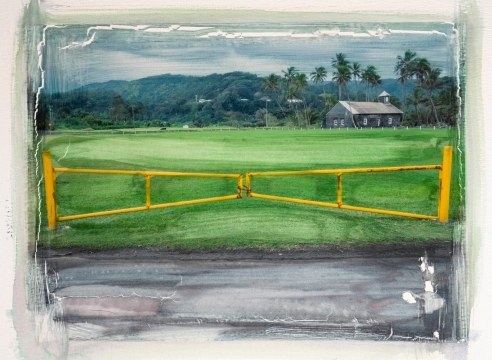 | The Photographer Using Frosting to Show Hawaii’s Dark Side.” Amuse. 18 July 2018. Hiller, Geoffrey. “Lawrence Sumulong.” Verve Photo. 8 September 2014. Mola, Anna. “Lawrence Sumulong | In Answer.” Private Photo Review. 8 June 2012. Sedacca, Matthew. “A Son of Immigrants Contemplates What His Life Might Have been.” The New York Times. 28 January 2019. Sumulong, Lawrence. “Bottleneck.” Invisible Photographer Asia. 25 April 2016. Sumulong, Lawrence. “Dead To Rights.” The Story Institute. Undated. “Artist Q&A: Lawrence Sumulong.” Nipa Mag. 15 October 2015.